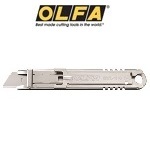 OLFA Safety Knife SK-14 Model 1134049. Stainless Steel Knife and Blade. Designed for the rigors of the Food Processing Environment. This knife is 100% Stainless Steel, Metal Detectable with a Self Retracting Blade and is NSF® Certified. Open-channel design for enhanced hygiene. Comes with 1 SKB-2S Blade. Uses replacement blades SKB-2S/10B. Ideal for cutting through light to heavy duty materials such as cardboard, plastic bags and pouches, stretch wrap, film, foil and plastic strapping.